Hey look! A blog! We want to keep you in the loop with what we're up to on the farm and what crazy, hare-brained idea Kim is trying to convince Rob and Phil to let her try this week (Black pigs! Green corn! Blue peas!) We'll share some recipes, mostly featuring whatever we've pulled out of the ground that day. We'll snap some pictures that will make you wish you were here (our way of saying "Hey! Come over for a visit!") We'll throw some words up as well, let you in on what we've been talking about and how we've been picking our way through this wild and crazy life. We're jumping head-first into this whole business of food and faith, so you can expect some thoughts and ramblings on that as well. And now, for the bread. We love how, over and over again, Christ used food to facilitate relationships and community. So often it was the simplest forms of sustenance that he used to do this. Bread. Fish. Wine. The symbolism and significance in the simple act of breaking bread with another is poignant. We love it, and we love practising it in our own lives. We also just really love bread. 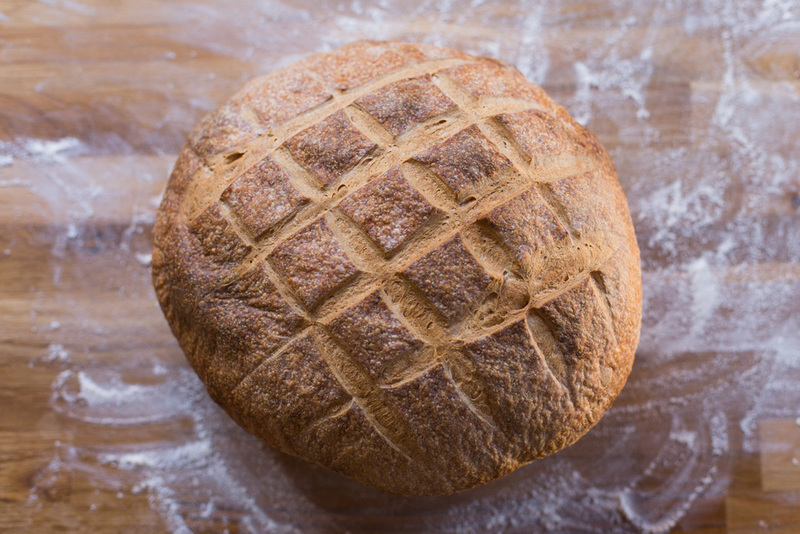 So here's the lowdown on our favourite - a crusty and chewy sourdough. If you've visited us at our farmstand in the summer you're likely familiar with it (but only if you showed up early, because it always sells out fast!). We have almost as much fun making it as we do eating it, and we didn't want to keep all of that fun to ourselves anymore. Give it a try! This is less of a recipe and more of a method, but you'll see us taking that approach quite often around here. We're all for simple and uncomplicated food and we go by feel much of the time. "An approximate generous teaspoon" isn't an uncommon term around here. Flour - we use white all-purpose because that's what we have around. If you have access to it, bread flour has a higher gluten content and will give you lovely loaves with even more rise. We've used whole wheat flour with great (albeit denser) results as well. Okay. Let's dive into this. You've pulled your starter out of the fridge. You've tossed it in a bowl on your counter (glass, ceramic, and plastic all work great. Metal, not so great.) You've been feeding it a bit of flour and water every half-day or so until you've got yourself about 4 cups of lively, bubbly, and very much alive starter for every loaf of bread you plan on baking. You're good to go. There aren't many critical steps in this process. But this is one of them: take some of the starter out and set it aside. About half a cup to a cup is good. Put it in a container in the fridge until next time. You want to do this before you add anything else (salt or active dried yeast). Sourdough has a tendency to be pretty dense, particularly when it's leavened entirely by the wild yeasty beasties in your starter. So we recommend giving them a hand and throwing in a little active dried yeast for extra lift. For every loaf you plan on baking, mix about 1-2 teaspoons of active dried yeast into roughly 1/2 cup of warm water with a teaspoon or so of sugar mixed in. Give it a couple of minutes to wake up and start getting bubbly. If you have a stand mixer with a dough hook, you can use that. If you don't, a bowl and wooden spoon will do just fine as well. Combine your starter, the yeast and water mixture, and more salt than seems wise (about 2-3 teaspoons). Stir to combine and slowly add flour until you've got a shaggy, doughy mess on your hands. Throw a bunch of flour on your work surface and turn your dough out onto it. Start kneading the flour in by hand. As you knead and as more flour is incorporated, you'll notice your dough becoming stronger and springier. You don't want to mix too much flour in, but you do want to work the dough and knead for long enough that you develop a good amount of gluten. Gluten, vilifed though it has been, is the key to good bread structure. When your dough springs back well when you poke it with your finger, you should be good. Oil a bowl at least twice the size of your ball of dough (it's fine if it's metal at this point.) Place your dough in the bowl, turn it a couple of times to coat in the oil, cover with plastic wrap or a tea towel, and place in a warm spot to rise. Once the dough has roughly doubled in size (the time required to rise will vary based on the temperature and how much dried yeast you added, but it should take about an hour and a half,) remove the plastic wrap or tea towel and punch it down. It will seem looser than when you left it to rise. Knead it for a couple of turns to strengthen the dough up again. Line a baking sheet with parchment and lightly oil it or give it a quick spritz with non-stick spray. Shape your loaf. If you're going for the traditional round look, use your hands like cups to pull the edges of the loaf down and tuck them under, turning as you go. Do this until the surface of your loaf is tight. If an oblong loaf is more your style, flatten your dough out slightly, fold it up like a letter and pinch the edge together to seal it. Turn it over, seam side down, and tuck in all of the edges. Place your shaped loaf on the oiled parchment. Oil the top of the loaf and cover with a piece of plastic wrap. Now for the final rise. You have a couple of options at this point. If you have time on your hands and you're after an extra tangy loaf with a blistered and crispy crust, put your loaf (pan and all) into the fridge and leave it there overnight. In the morning, take it out and let it warm up and rise on the counter. If, however, you're in a need.bread.now situation (we've been there) or extra-tangy isn't your thing, just leave it in a warm spot on the counter to rise. In either case, allow the loaf to rise until approximately one and a half times its original size. Using your hand, dribble tap water over the loaf. Gently spread it over the loaf with your hand. This will help to keep the crust soft enough to accommodate the loaf's rise (called "oven-spring" for bread nerds) and keep the bread from splitting. Take a sharp knife and gently slash the loaves. Not too deep. This will help to give the loaf room to expand. It also makes it look pretty cool. Place the pan in the oven, turn the temperature down to 425 F, and set the timer for 15 minutes. After 15 minutes, turn the pan. Check again in 10 minutes. You want the crust to get pretty dark and the bread to sound hollow when knocked. If it's not done after 25, check every five minutes until it's done. Baking time can be up to 40 minutes depending on the size and density of the loaf. Allow it to cool. We know, it's hard. But be strong. It will be worth it. You know what to do next. Slice it up. Toast it. Share it with friends. We won't judge if you skip the knife and tear into it with your hands. What is a sourdough starter? Where do you get one? How do you look after it? We're glad you asked. If you make your way over here they'll walk you through what a starter is and how to keep yours bubbly and happy. We'll be honest. We started with a digital scale several years back. We were precise. We were by the book. Our starter was exactly 100% hydration thankyouverymuch. And then we became comfortable with the process. And we figured "Hey. They were making bread before digital scales. Heck. They were making bread before measuring cups!" And that was the end of that. So here's how we do it now. If we're not using our starter for more than a week, we'll stir a roughly equal amount of flour and water in and toss it back in the fridge. When we are ready to make a loaf, we'll pull the starter out of the fridge a couple of days prior and mix some water and flour in to keep the consistency roughly that of muffin batter. We'll keep doing this, feeding with a little flour and water, letting it sit and get bubbly for about half a day, and repeating until we're ready to make bread and we have enough starter for the amount of bread we want to make. Basically, what we're saying is this. If you are a precise sort-of-person, have at 'er. Weigh your flour and your water. You are going to make great bread. If you're not, if you're a pinch-of-this-dash-of-that sort-of-person, don't be scared off. You too will make great bread. If you don't have a sourdough starter, fear not. You have options. Option the first - Hit up a friend that has a sourdough starter. Guess what guys? We're your friends. And we have a starter. Let us know in the comments or contact form and we'll hook you up. Option the second - Make your own! This is for the DIYers. We did this before we purchased the starter that we currently use. It worked. Click your way over here and here where some pretty smart individuals explain the process in far better detail than we would. Option the third - Buy one. Our starter descended from this guy several years back and we have been extraordinarily happy with it. 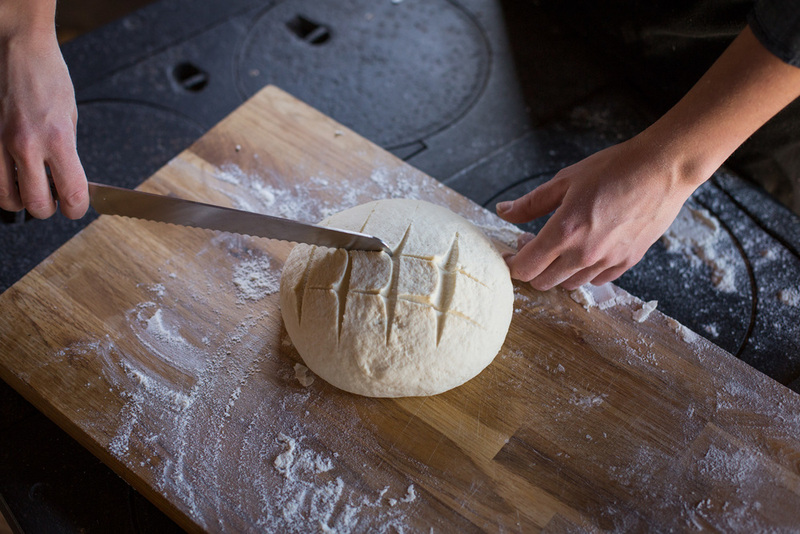 We highly recommend King Arthur Flour, both for their quality products and their sage baking wisdom. Check them out.